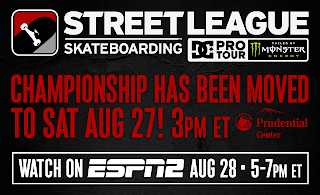 In response to Hurricane Irene, please note that the Street League Skateboarding Championship event at the Prudential Center in Newark, NJ that was originally scheduled for this Sunday is being moved one day earlier to tomorrow, Saturday, August 27th at 3pm. Tickets will be honored for the new date and doors for the public will open at 2pm. Refunds for ticket holders who cannot make the new date, will be available at the point of purchase beginning on Monday. The championship broadcast will still air at its original time-slot at 5PM ET on August 28th.